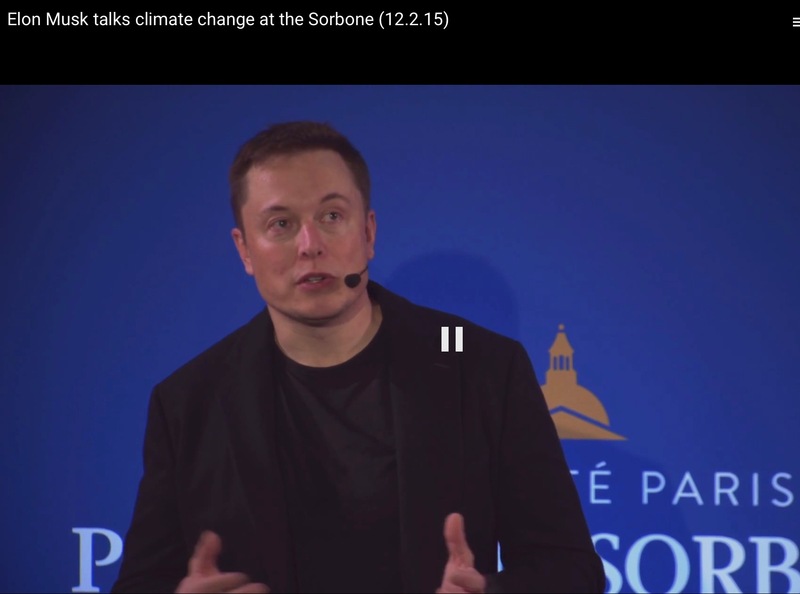 You are here: Browse: Home ∼ Elon Musk’s WOW: What if Everyone at the Climate Summit Watches or Reads His Talk? Elon Musk made a surprise trip to Paris last night to an event accompanying COP21, the climate summit. His speech may become part of a climate solutions turning point. He chose not to speak at a large high-level institutional event. Rather, he addressed the engineers and designers of the future at the University of Paris-Sorbonne. Instead of a grand keynote, for 13 minutes, he described the challenges and presented a simple, elegant solution. He empowered his audience to get involved politically. Then he took 38 minutes of questions. Here’s a quick tour. In questions, he repeatedly praised revenue-neutral carbon taxes. He called for governments at COP21 to put their feet down and get started. He showed how low but rising carbon taxes will change business practices in five years. (25:10) That matches the timetable for the just-announced international Carbon Pricing Leadership Council, which aims to get in place carbon pricing everywhere by 2020. He also answered respectful questions thoughtfully and imaginatively. See the video — or, especially after the first 15 minutes, for the Q&As without his images, in less time, get the full transcript (PDF) or read it on a single web page. You’ll pick up nuggets on why we can’t wait for new technology “miracles,” what climate-concerned young people should do with their lives, batteries, electric cars, and space. The event’s Youtube video is catching on, currently growing by thousands an hour. For more about carbon pricing during and after COP21, see Heads of State and CEOs Declare Support for Carbon Pricing to transform Global Economy. For more about revenue-neutral carbon fee and dividend, see Citizens’ Climate Lobby and its activities in Paris around COP21.